A few days ago, I started to panic as I saw a lot of people writing that they had almost finished their Christmas shopping whereas I had barely started! That night, I purchased a Mega Bloks Steer Me Steve on Amazon and a Sing & Giggle Mickey and felt a bit calmer. I could officially say that I'd started my shopping. Chris had the day off yesterday so we decided to get some bits in. C is obsessed with Mickey Mouse Clubhouse. We watch at least three episodes a day. 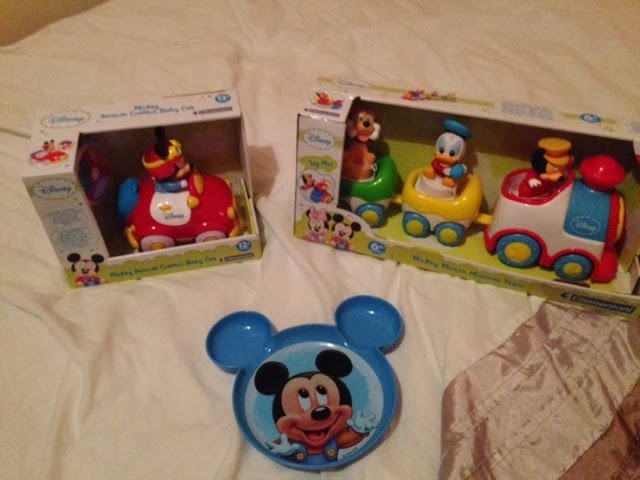 B&M Bargains, I find, in the best place to find Mickey Mouse toys. 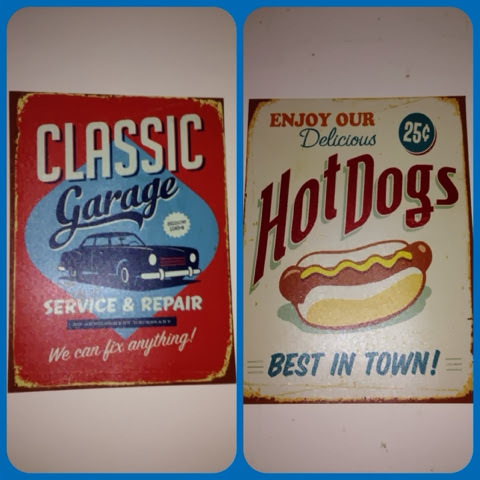 We purchased these for him as I know he'll love them. 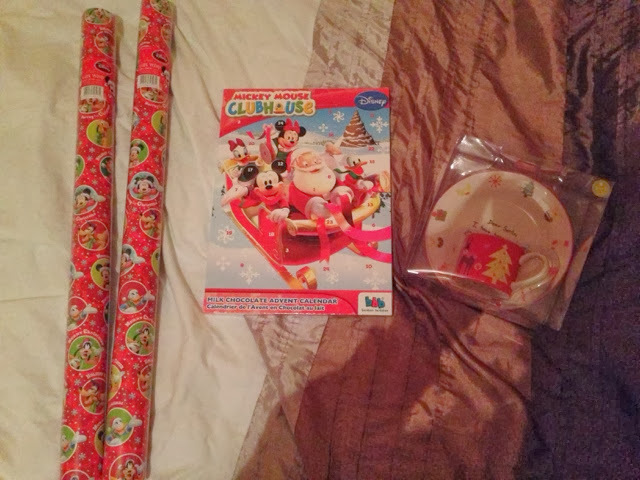 I had seen this wrapping paper before so I knew I needed to get some in just in case I left it too late and couldn't find any anywhere! I said to my mum yesterday that I planned on getting C an advent calendar this year and just struck lucky by noticing this one. The Santa Plate & Cup was another item that I saw a while back. 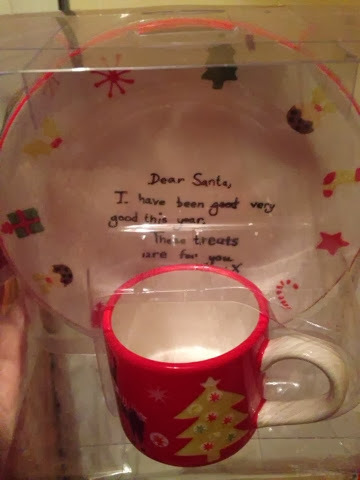 I want to have a tradition of leaving Santa's treats and milk out and this was so cute that I just had to buy it. I had heard that Sainsburys were having a 50% off sale on their toys. I suggested to Chris that we should pop in to have a nosey and we ended up grabbing a basket. The offers were just too good to pass up. Fantastic bargains! Altogether the total should have come to £36 but we got everything for £20! 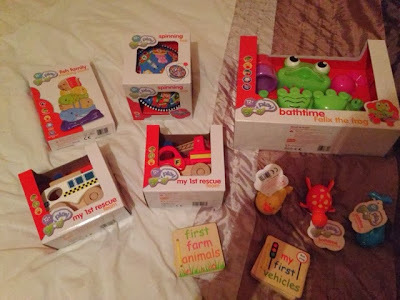 I'm so pleased especially with the wooden toys. The sale is on instores until Tuesday. Had to buy bits for us too! Check out our cool new retro canvases! 2 for £4 in B&M Bargains. Have you made a dent into your Christmas shopping yet? Have you come across any great toy deals? 10 comments on "Christmas Shopping"
We've almost finished our Christmas shopping. For the first year ever I'm actually organised! Sam won't let me buy any more presents for Dex. We only have three for his Christmas presents :( but he says he has plenty already. I didn't have a good childhood so I think I over compensate with Dex. His birthday is only a few weeks before Christmas too and we have three presents for that also. Basically, in a nutshell, I want to go mad with buying more presents and Sam is reining me in! Boooo! Great bargains! I am sure your little boy will love them. OHHH Ive only got one present so far I best get a move on. You found some great buys. Wow you've done really well! I had all good intentions of being finished by now in the hope of not having to think about Christmas whilst in a newborn haze - however my finances had a different idea so it's all pie in the sky and ideas for now! I'm starting mine this week. I am never very organised so it is usually a last minute rush for me but this year I am going to try and get ahead! You've got some fantastic bargains here!